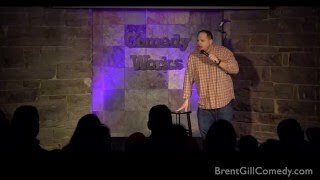 Brent Gill is a Denver comedian now living in Los Angeles. While regularly touring the US and Canada, he made his television debut on Viceland’s “Flophouse” followed by an appearance on “Jimmy Carr and the Science of Laughter” on the BBC. Brent has devoted his life to comedy. Through his stand-up, he reports back to audiences on the terrible life-decisions and ridiculous misadventures that make up his daily existence. His comedy is fun, energetic, and authentic with a splash of filth… because who doesn’t like a good old fashioned dirty joke every now and then?Over the years, Brent has featured for such high-profile comedians as Dave Chappelle, Ron White, Bob Saget, Whitney Cummings, Dave Attell, Gilbert Gottfried and was selected for the High Plains and Sacramento Comedy Festivals. He can be heard every Tuesday on his comedy-news show and podcast, Infauxmation, where he and fellow comedians riff on weird, but real, news from across the world. Brent is also the creator and producer of the Boulder Comedy Show, regarded by many as one of the best independent weekly comedy shows in the country.